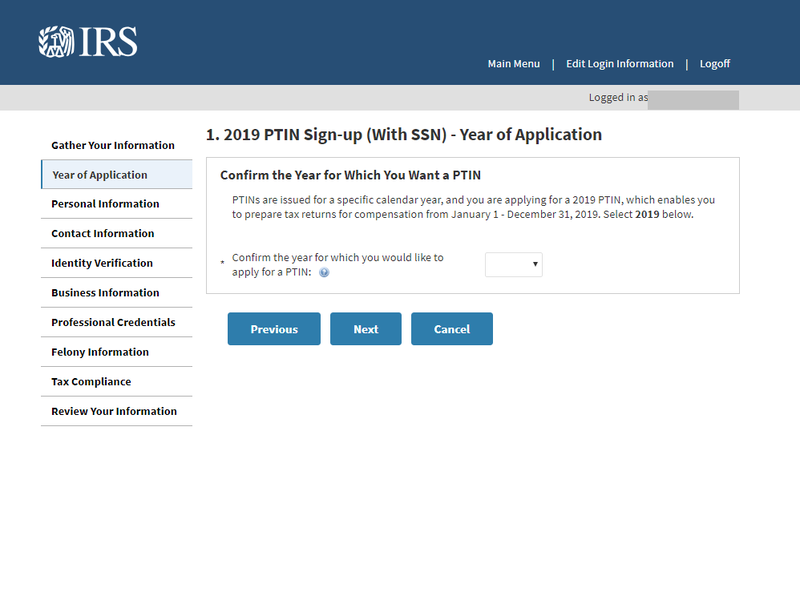 To begin your PTIN application you first need to create an account. Click Create Account in the new user box. Not a New User? Click here. 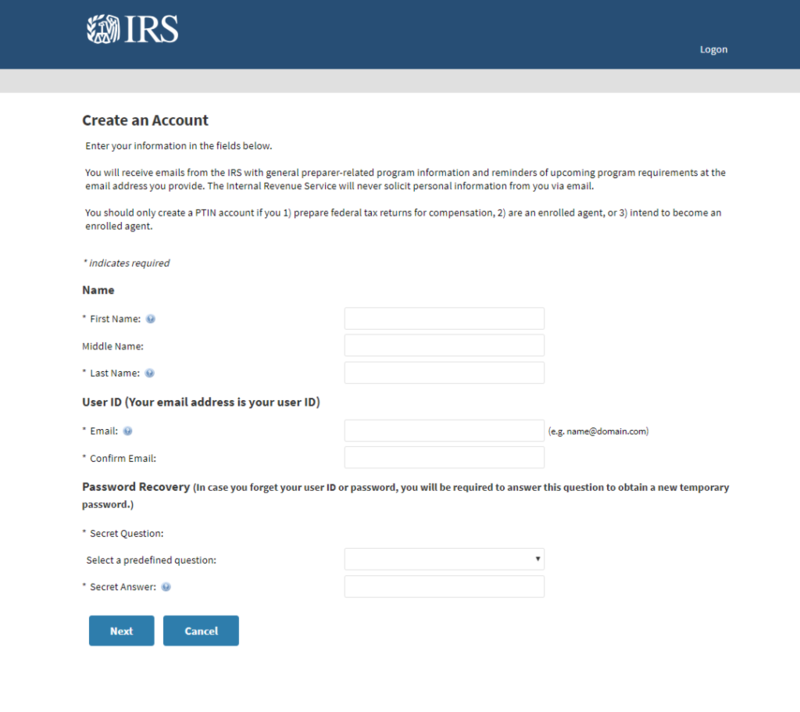 In the Create an Account section you are asked to provide general information in addition to selecting a security question and answer. Click next to continue. 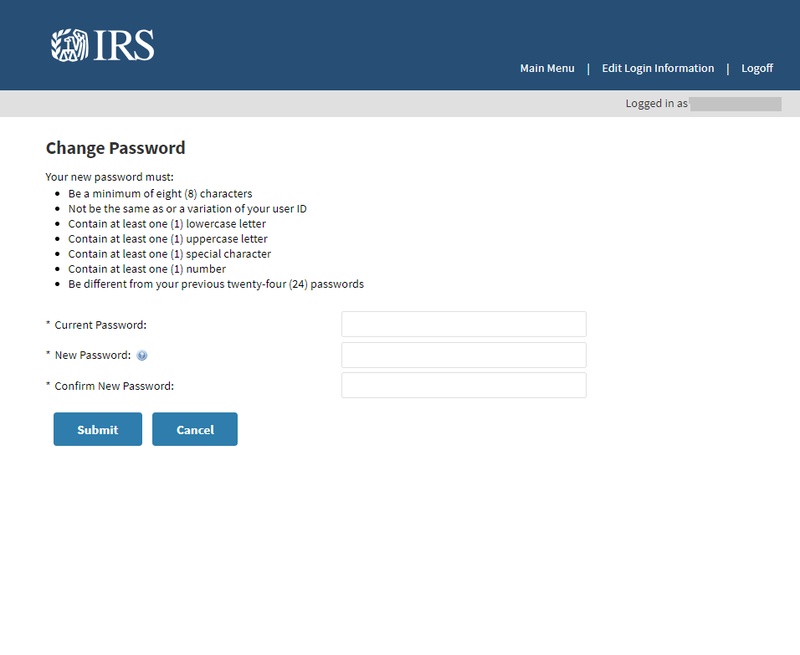 You arrive at the Change Password section once you receive an email containing a temporary password. 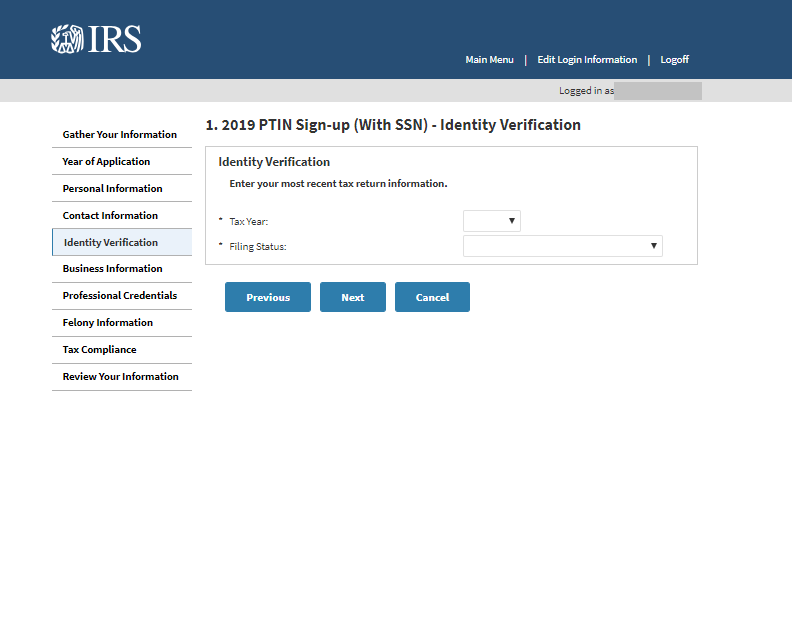 You are prompted to revisit the PTIN system login page, this is where you use the temporary password to sign in. Your User ID or Username is the email address you provided when creating the account. You will once again be asked to provide the temporary password as the current password on the Change Password section. Click submit when you have created your new password. 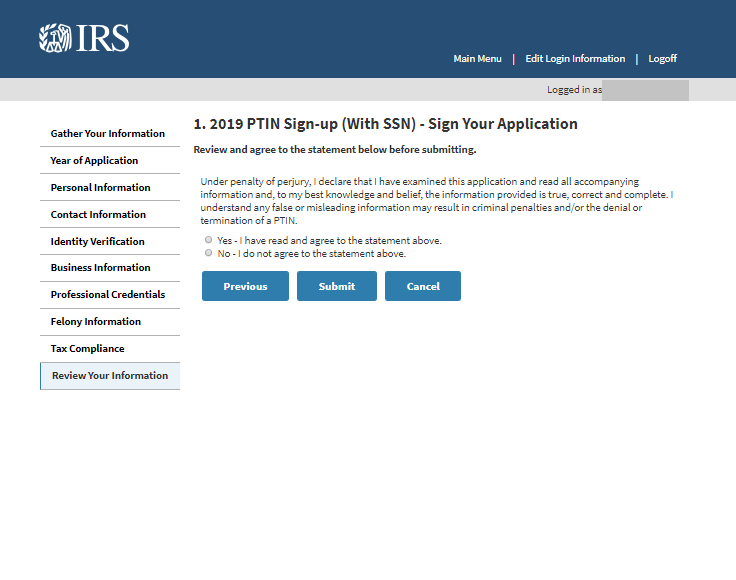 In the Apply for a PTIN section, select 2019 PTIN Sign-up (With SSN) to begin the PTIN application. Click next when you have gathered your information and also when you’ve selected the upcoming year for your application. 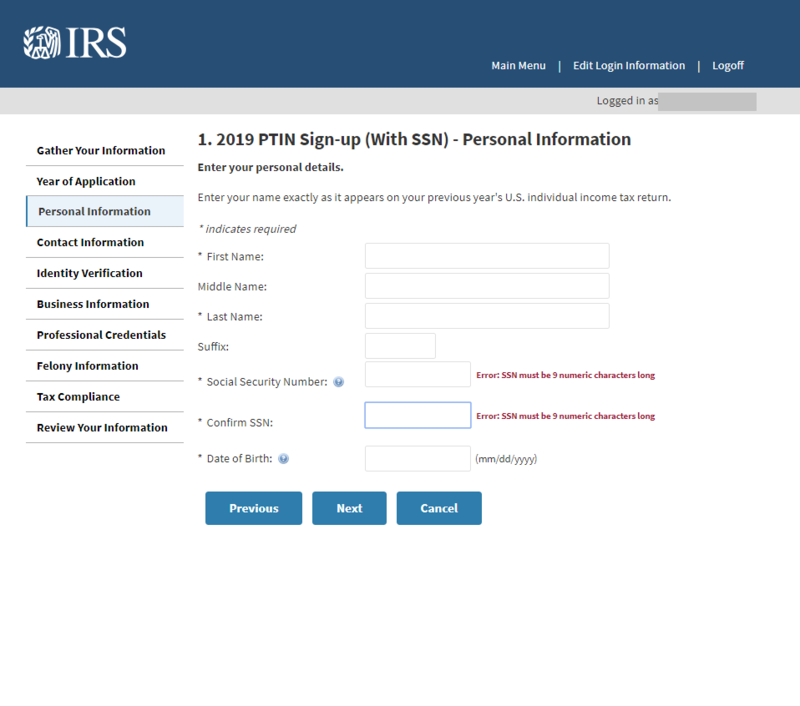 In the Personal Information section you are once again asked to provide general information in addition to your social security number and date of birth. Click next to continue. 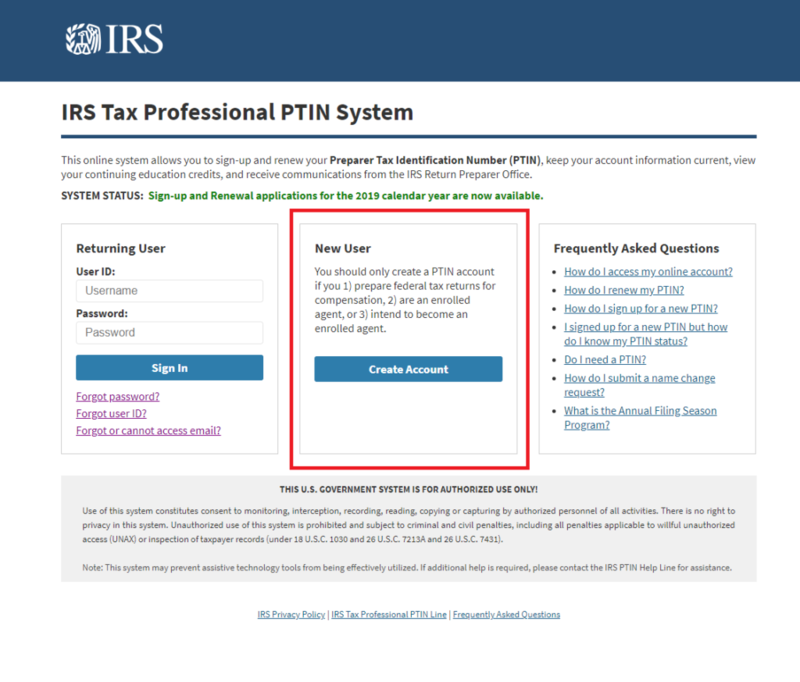 The Contact Information section asks for your Address on U.S. 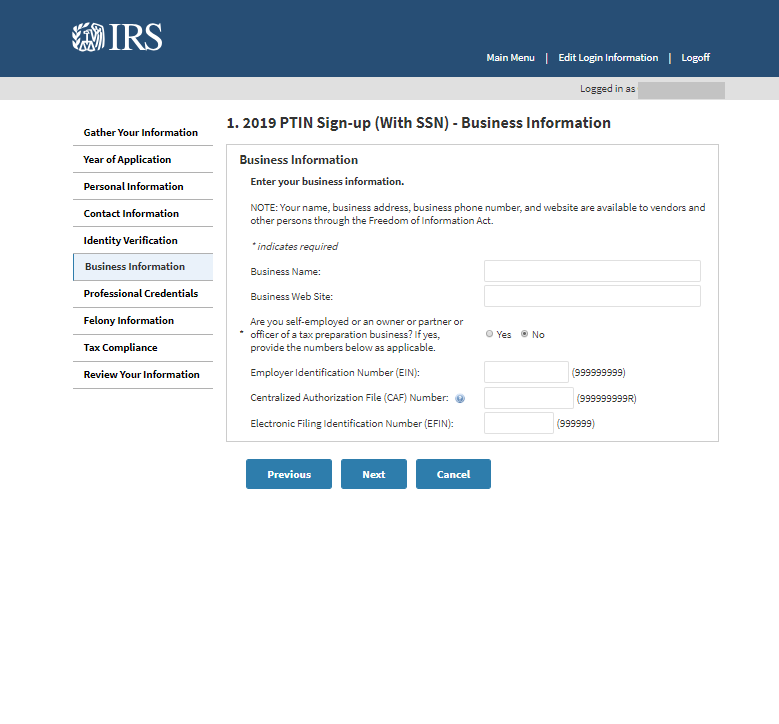 Individual Income Tax Return, Personal Mailing Address, and Business Address. 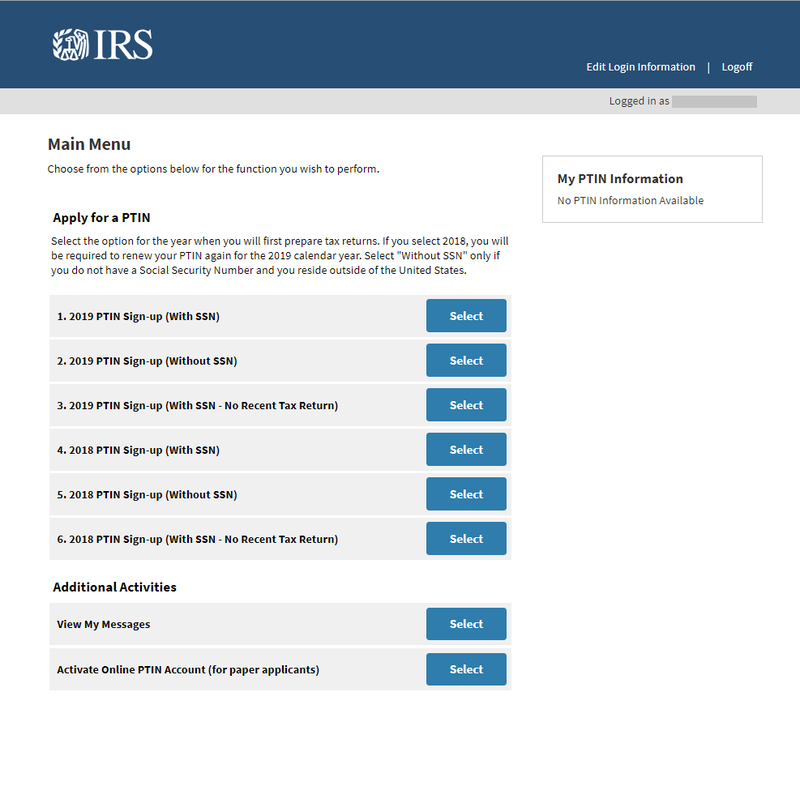 Enter your most recent tax return information and click next to continue. Enter your business information in the corresponding sections. 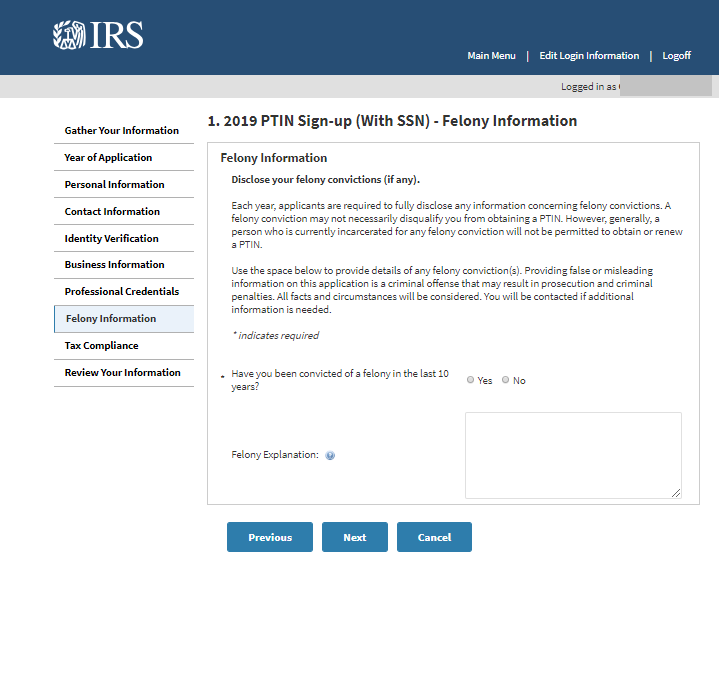 If you are an employee, verify with your employer that you can use their information to complete this section. Click next to continue. 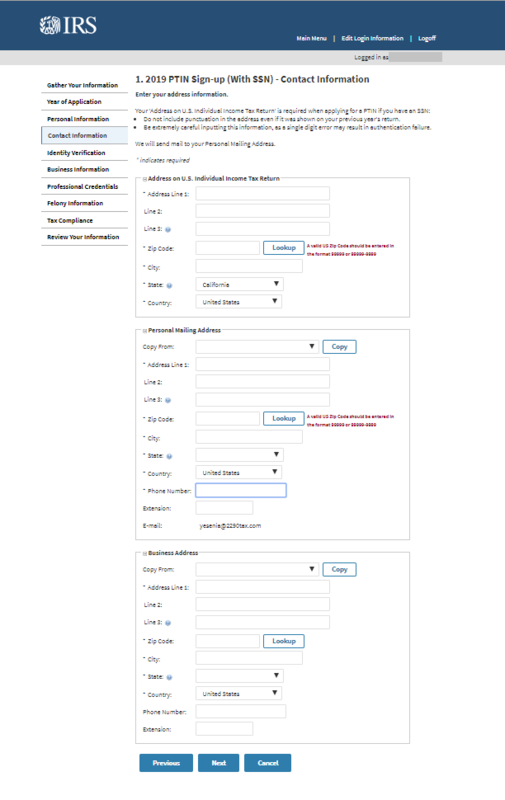 Indicate if you have professional credentials in the Professional Credentials section and click next to continue. In the Felony Information section, it is asking to disclose, if any, felony convictions. Click next once completed to go to the next section. 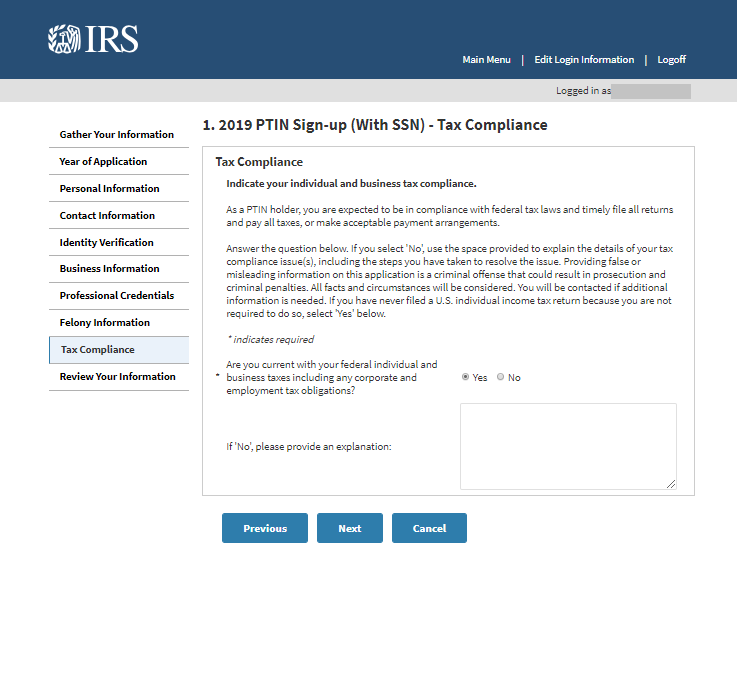 Indicate if you are current with your federal individual and business taxes in the Tax Compliance section. Click next to continue. Click submit once you agreed to the terms in the Sign Your Application section. 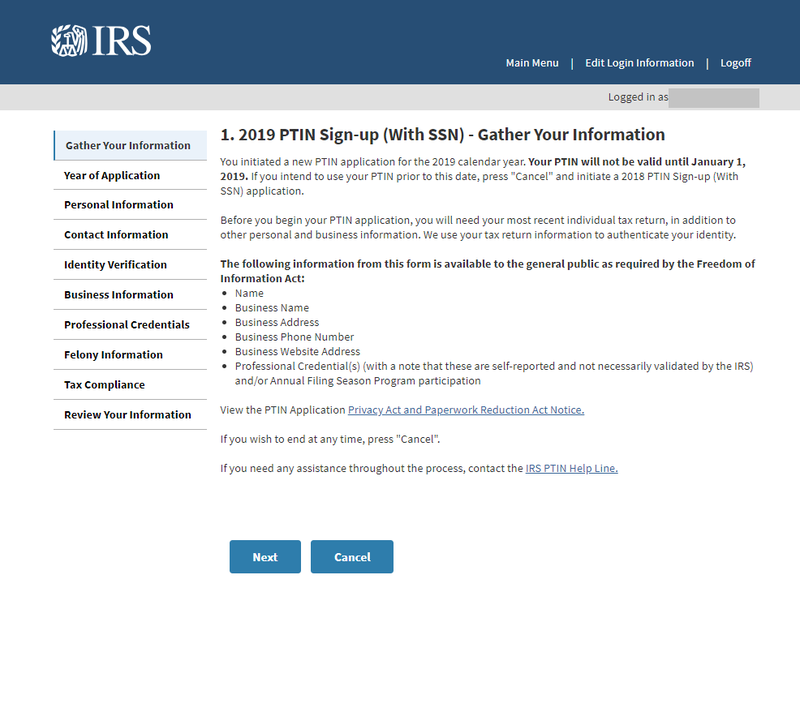 This will complete your PTIN application. 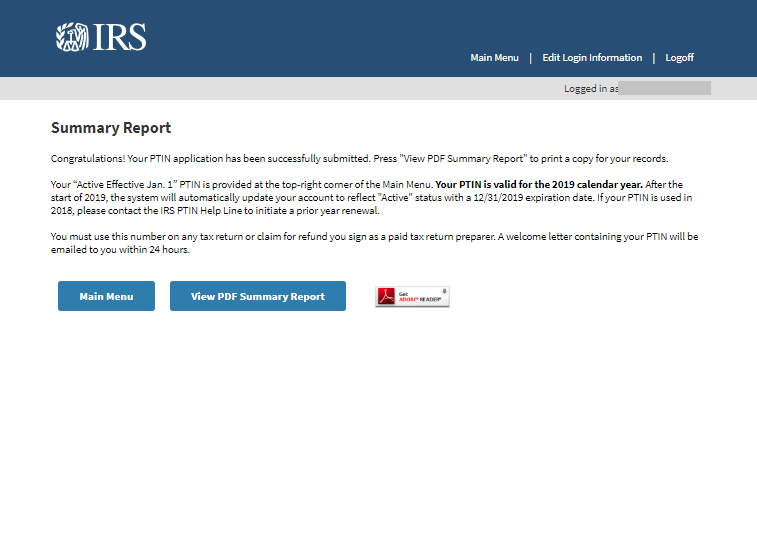 The Summary Report discloses that your PTIN will be active for the calendar year you selected and it also includes the expiration date. 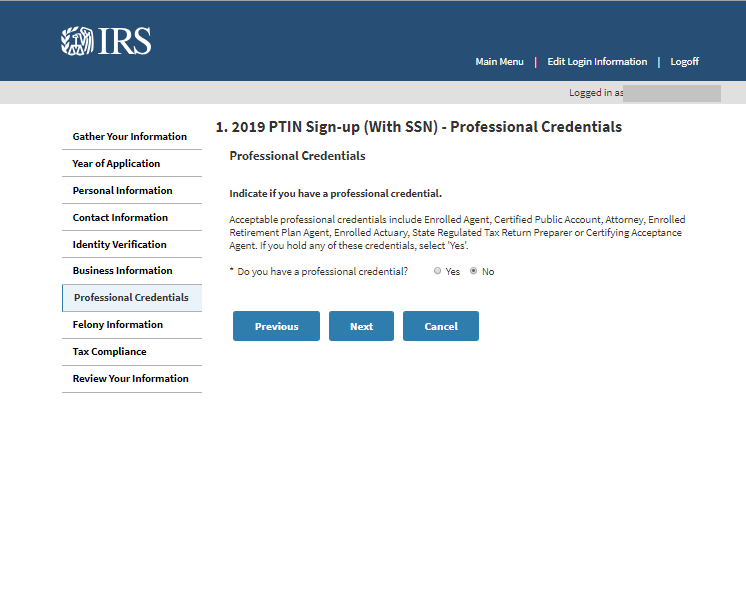 You can contact the PTIN Helpline at 877-613-7846 if you encounter any issued. Comment below and let us know if you found this guide useful or if you have questions. Stay connected and follows us on Twitter and Facebook.